I did this project a long time ago, but I thought of it recently after seeing this blog post about overdyed rugs. I made these curtains when I was first living in Boston. I moved there with no job, no furniture, and very little money. If you missed the post with paintings of my apartment there, check it out. Cash was short, and fabric stores were really hard to get to for someone relying on public transportation, so I started sewing with things I found at the thrift store. For some reason, I can’t remember why, I was determined to have red curtains for our living room. 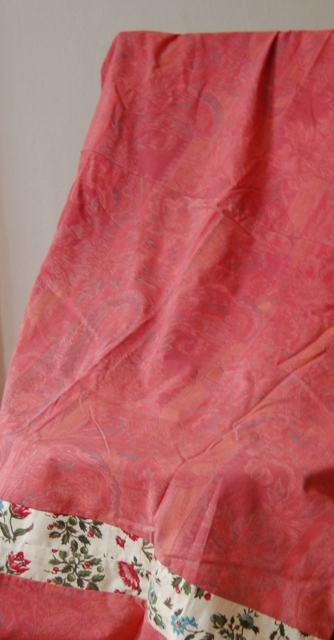 So determined the curtains be red that I dyed sheets and stitched curtains out of them by hand because I had no machine. Well, we did have some crazy boy neighbors who had a gigantic telescope which they swore they weren’t using to spy on us. These sheets/ curtains are 100% cotton and were originally a peachy color. You can also start with a deeper color and opt to soak your fabric in a bleach solution to remove the original color. This is called discharging. If you’re going that route, you’ll be better off with a fabric that is still fairly new, as the bleach will weaken the fibers a good bit. And I wouldn’t try discharging fabric for a heavy-wear item, such as a handbag, or something that will need a lot of washing, because again, the fabric will be more fragile. Remember that the color you start with, however pale, will influence the dye color, and the result will be different from what you’d get from dyeing plain white fabric. You’re layering color. A basic knowledge of the color wheel is useful here. As a general rule of thumb, overdyeing is going to work better if the original color is in the same color family as the dye color. 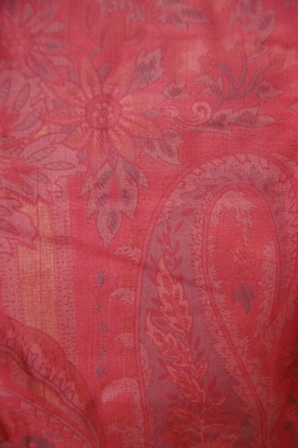 For example, my peachy sheets and the red dye color are both warm colors. Had I chosen to dye them blue, the peach would have tempered that blue, making it a little muddy. Not necessarily a bad thing, but a little unpredictable. Skip grocery store dye, which fades and bleeds a lot when you wash, and use procion dyes like those found at dharmatrading. For more even color, soak the item in clear water first before dipping it into the dye. This is not an exact science. Chances are, your end product will not look the way you pictured it, and it’s best if you’re okay with that from the beginning. Also, don’t dye something precious. That’s why thrift store-finds are a perfect choice here. If it doesn’t turn out, you don’t get your heart broken. Read my earlier posts about getting started with dyes here (animal fibers) and here (plant fibers). Also check out these posts from ohfransson: discharging here and overdyeing here. It’s been a slow week creatively. I limped through a little writing and inched along on my son’s bedcover (almost finished! ), but it took everything out of me just to keep the kids clean, fed, homeworked, and back and forth to school and home. Still, I have to keep in mind that even limping and inching are moving toward my goals. Have a great weekend. It’s sunny here and above freezing, which means spring fever is visiting us once again. This entry was posted in Crafts, Fiber Arts, Sewing and tagged craft, curtains, dye, dyeing, fiber art, hand dyeing, overdye, red, sewing by Emily Smith Pearce. Bookmark the permalink. Emily,my favorite expression for when something is barely moving is “oozing forward with deliberate speed”. Hmmm I need those curtains in my kitchen! Sounds like you did some really worthwhile things this week but I do know how it feels to have the creative outlets crowded out by other responsibilities.